Ulthok was worried what might have been behind door number one so when the door flung open he wasn�t surprised there were more enemies, but he didn�t expect a floor of Goblins. From behind him Valene lunged with her blade, trying to drive it into the throat of the nearest goblin. As she drew closer maybe the two of them could figure out a way to handle that many goblins all at once. Goblins had a nasty way of overwhelming groups with their numbers and they certainly didn't want to be losing any of their tall ones already. Posted on 2013-08-20 at 03:12:21. Don't you just love a little winter? Much like the sea itself, Sir�ne was in a constant state of motion, flowing from the movements of one spell and then into another. It felt right. Arcane and divine energies coursed through her like twin rivers, filling her with vitality and power. There was no other time that she felt as truly alive as when she channeled magics. With the energies of her last spell settling around the remaining orcs, it would not be long before the heat incapacitated them or at the very least slowed them down greatly. The five warriors that faced the beasts would make short work of them, of that she was certain. Flicking her wrists outward, the enchantress made ready to send more magical aid their way. Yet before thought could become action, shouts of warning from the halfling cleric and the golden haired she-elf drew her attention to the sea of goblins flooding into the hallway. The diminutive beasts scrambled on top of one another as they poured out of the doorway directly in front of her. With nothing standing between them, the goblins would overrun her quickly, but just the same, there would be nothing to protect them from her. Sir�ne drew power from the frozen north and the storms of winter. Her voice rose into the air in otherworldly tones as the arctic cold filled her. Uttering a final word of power, the enchantress breathed the cold into her hands and hurled it out toward the goblins. A swirling tempest of cold exploded from her outstretched hands, obscuring sight and cutting through the goblins in its path. Posted on 2013-08-21 at 01:59:36. Cor and the orc he was fighting once again prepared to trade blows. Out of the corner of his eye, Cor noticed Aliya's sword go past the orc she was attacking. Knowing he needed to assist her, Cor went for an overhand chop with his axe. The orc attempted to hit Cor, but the blow was reflected by Cor's armour. Cor's attack, however, was successful, cutting down into the orc. Shifting forward quickly, Cor found himself and Lothor coming to Aliya's aid. Suddenly, a noise from behind him, and the calls of 'Goblins!' notified him to the goblins entry. Cor knew withdrawal would be difficult, and Aliya was still in dire circumstances, so Cor decided to kill this orc (#1) first. Once it was finished, Cor would run back to assist the others with the goblins. Cor had yet to know how many goblins were behind him, but by the sounds of things there was a lot of them. Posted on 2013-08-21 at 02:59:39. Alyia parried the orc's axe blow with her dagger the blade biting into her shoulder. She shouted a thanks to lothor and cor as she dove past him to retrieve her sword. "GOBLINS!" cryed from Amara and Valene. Alyia turned momentarily taken aback by the sheer number of goblins spilling from the door way. her sword once more in hand. cold air blasted forth from Sir�ne. they were pinned between the goblin horde and what was left of the orc's. Alyia looked to cor for direction. Things kept getting interesting by the minute. Posted on 2013-08-23 at 23:46:25. Bareel continued to sing as his axe bit into the stinking flesh of the Giant Orc; he drew back to finish the job when something crashed into him from the side and staggered him into the stone wall. Pushing himself off the wall he grinned as he saw the Orc who had pulled itself off of the many spikes that covered his armor. "Wha's amatta, bite ofa mor' than ye can chew?" He said with a grin as he charged after his opponent. (#8 ) and began to sing again. Unknown to the Dwarf, the last verse of his song became a portent of things to come as Goblins begam to charge into the hallway from the first doorway they past. For the moment, his attention was held by the Larger foes before him as he stood shoulder to shoulder with the Lady Paladin who seemed to be holding her own quite well, for a Human. Posted on 2013-08-24 at 12:39:18. Lady Jessica whooped as her sword cleaved through her adversary; drawing her sword out of it, she flicked the blood from the blade as she moved up to the next Orc. With another cry of exertion, �Ahhhh!� she attacked thrusting her sword at the Giant Orc (#7) as she nimbly used her shield to block it's own attacks. Posted on 2013-08-24 at 19:28:58.
Who asked you to the party? In full song now, Weaver has Sword and Dagger in hand. The sound of cracking to his left and then �Goblins!�. Weaver turns to see a wave of Goblins pouring out of an open door. A fire within him burns bright. Weaver reacts devoid of thought and lashes out at the two facing him (# 7 with dagger +3 Atk: 2 and #3 with long sword +3 Atk: 2). Posted on 2013-08-24 at 22:09:53. As the eleven-person party found themselves headed into round 3, they found they were in danger of being swarmed and overrun by a horde of Goblins. The smelly evil little creatures looking to carve the party up for stew. However, that thought of the first twenty-five Goblins was quickly erased. Once again leading off the party�s attacks, Sirene quickly cast the spell of Cone of Cold and aimed it perfectly through the open door into the mass of charging Goblins. In instant, the leading twenty-five Goblins were dead as were more of those following. Though the exact number dead from the Cone inside the room was unknown, at least for the next round the party was free of them. However the power of the Cone easily enough to catch all the Goblins outside the room and kill them, so to was it big enough for its edges to hit to the walls on both sides of the doorway and turn back towards the party. For most, Weaver, Rayne, Sirene and Amara they found themselves nicely clear of the backlash, however Ulthok and Valene were not. Though having taken steps backward to clear the door they could not clear the rebounding edge of the Cone. Ulthok was hit dead on and though making his save took a horrendous amount of damage, the icy blast flinging him backwards to land on the stairs. By some grace of his God, he was alive and conscious but his face and exposed skin burned by the extreme cold. As for Valene, the Thief/Cleric fared better with Ulthok in front shielding her and having been on the very edge of the Cones backlash. Like Ulthok making, her save was easy and though she took damage, it was nowhere near, what the Halfling Thief/Mage had. For the moment in the clear from any danger, Valene was free to act. The next of the party to action was Aliya and her fight with Orc #1. Having lost her sword in the previous round she thought of nothing else and lunged for it leaving herself wide open to a free Orc attack. As her hand was just feeling the hilt of her sword her back felt the piercing blade of the Orc�s axe. The power and force behind the undefended blow was such that the blade entered with little obstruction and severed her spine almost cutting the Half-elf in two. Aliya unconscious before feeling the pain. Drawing back for a second attack the Orc never had the chance as both Lothor and Cor�s attacks cut the Orc�s right leg and his head from his body. The Orc dead, falling to lie next to a crippled and unconscious Aliya. For the Lady Jessica none of this did she see as the Orc in front of her #8 in pain from his scalding hot armor and in such a rage charged forward. In the end, he should have charged the other way as the female Paladin easily cut him in two. Turning to seek an enemy she watched as Barreel in full form charged the last Orc and without raising his axe skewered the Orc against his body tearing off its legs and killing it with the armor�s spikes. The last of these Orc�s dead and the Goblins for the moment held at bay, the party now had a round to catch a breath and heal. (DM OOC: Ok two characters took some major damage so of course they need a lot of healing. Ulthok took 49 points of damage is conscious but stunned for the next round and is not bleeding due to his exposed skin having been freeze fried away. Aliya is bad I rolled an undefended critical, her spine is severed and she took 50 points of damage. She is unconscious for the next 3 rounds and bleeding at 5 hp�s a round. If you look closely you�ll see two black lines within the blue Cone of Cold area. That is the radius of a normal Cone of Cold to kind of give you all an idea of why the Cone backlashed. Posted on 2013-08-26 at 02:21:43. Cor and Lothor both moved up to engage the orc. Aliya dove by the orc in an gamble to get her sword back. The gamble did not pay off; the orc turned and slashed her across the back with it's axe. Cor's gut churned as he realized how serious the wound was; the axe nearly cut her in half, and if someone didn't get to her soon, she would die. With a newfound sense of urgency, Cor and Lothor took down the orc. Lady Jessica and Bareel then took down the two remaining orcs, leaving only the goblins left. Cor quickly ran over to the crippled Aliya, and readied Healing. As he cast it, Cor said, "The others need help back there! I'll take care of Aliya!" After the Healing spell was cast, Cor decided Aliya needed to be moved closer to their allies. Helping her move, if possible without causing more damage, Cor would help her move closer to the party. Cor knew that if her wounds were too serious for her to move, he would guard her from more attacks. Posted on 2013-08-26 at 18:19:51. Posted on 2013-08-27 at 02:53:07. As the last pieces of the Orc opponent before her fell to the stones, Lady Jessica turned and looked for another adversary; finding none she shuttered slightly as the adrenaline rush began to subside. It seemed that for the moment the battle seemed to have lulled. Cor said, "The others need help back there! I'll take care of Aliya!" �See to Master Ulthock and the Lady Valene I will see to this.� Weaver then moves to the open door. Jessica saw that some of the party was injured and down; seeing that those with healing skills were tending to them she started to assist but knew her meager healing skills were not up to those of others. Weaver had moved to guard the first doorway they had past where it looked like Goblins littered the floor; the Paladin turned and, flicking her blade causing a spray of blood to dot the wall and floor, kept watch over the hallway guarding the group so the healers could do their work. Jessica heard people talking behind her about the seriousness of the injuries; she decided that while she was just standing there guarding the group that she would pray for them. Reversing her sword grip so that her sword was pointing towards the ground, she knelt on one knee putting the point of the sword on the floor as she grasped the hilt with both hands. She prayed to Athena, Goddess of Wisdom and Battle to look over her companions and especially the injured who were fighting for the cause of good and righteousness. Posted on 2013-08-28 at 10:48:08. "Whooooooooshhhhhhhhhhhhhhh�, a bitterly frigid blast crashed into Ulthok; a part of the Cone of Cold spell bounced off the door frame. The deadly cold catching him unaware and knocking him backwards off his feet. Although the blast last only a second it cast him into the stair well. As he crashed his head bounced on to the stairs; the sound of glass breaking seemed to ring in his ears. In that moment his body convulsed as it reacted against the cold that was piercing his clothing and armor. A scream should have shaken the hall as an unbearable pain came from where the opening of the hood of his cloak touched his head. But there was no sound other than a sucking gasp that rumbling out. A searing agony caught her by surprise as it exploded into Peri�s mind. She watched her Mage collapsed on the stairs. �Ulthok�, she screamed diving from her hiding place near the ceiling. Hovering over the injured Halfling her tiny heart nearly burst as she stared into the skeletal remains of his face. Deep set empty sockets stared back from where his soft Hazel eye once glimmered. Chunks of frozen skin lay on the stair, sparkling from the crystallized frozen blood. She could feel his life essence ebbing away, her companion was near death and would not survive another attack. �Someone help him,� she screamed although it came out barely a squeak. Ulthok saw a ruined death face through Peri�s eyes. "What is my brother Divot doing here?" Posted on 2013-08-29 at 18:38:55. The last of the orcs had finally fallen so she turned to face the mass of goblins who were trying to flank them. Aliya had been nearly severed in two and Rayne was about to rush to her aid when Cor who was much closer to her position had decided to cast a healing spell on her so she changed her mind. Lady Jessica was down on one knee ready to protect the healers as she prayed for the safety of her friends. 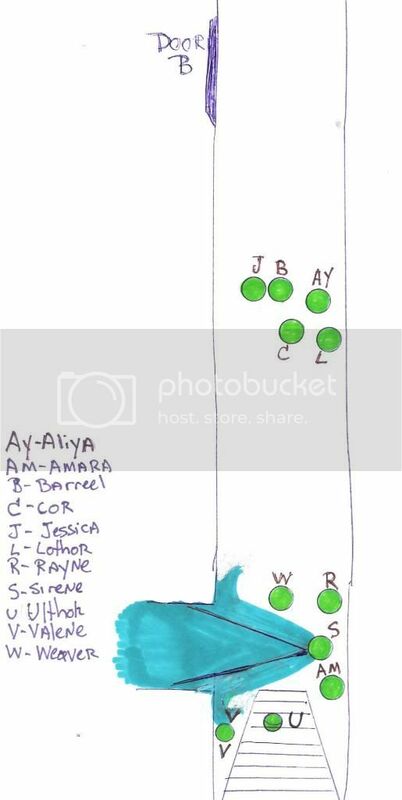 The party of eleven was scattered, Lady Jessica, Barreel, Aliya, Cor and Lothor were between the two doors, while the rest of the party was still near the stairs closest to the goblins who had tried corner them between orcs and goblins to divide their numbers. Rayne noticed Sirene casting a spell, and the effects were both a blessing and a curse. The Cone of Cold was too wide to fit nicely through the door and therefore a section of it had reflected off both sides of the frame and hit Ulthok leaving him with exposed skin. The Cleric darted over towards her companion knowing the goblins would be held at bay for at least one round. Kneeling down to the conscious but seriously injured Ulthok she casts Cure Serious Wounds on her friend. Once the spell was complete she looked around and readied herself for the flood of Goblins she knew would head their way in the next round. Posted on 2013-08-31 at 01:31:43. Wild laughter filled her head as the frozen maelstrom flowed out of her. The goblins died, they didn't even have time to scream. A seductive voice whispered in her mind, calling for death. It hungered for blood, for death, for vengeance. This was the lady of retribution, and her siren song was sweet. The chill air around her seemed to crackle and hiss as the enchantress called forth the power of retribution. With a slow, deliberate step, Sir�ne moved towards the doorway, crunching the frozen goblins beneath her feet. A flicker of movement at the corner of her eye drew her notice, and she slowly turned her head. Her eyes widened in shock as she took in the scene before her. Ulthok's small body lay on the floor just beyond the sea of goblin corpses. His skin had been seared away by a burning cold, and that could only have come from one place. It had been her hand that had done this. The horror of the realization washed over her, and she sprung into action. Moving with alacrity, the copper skinned elf joined the others that had gathered around Ulthok. Sir�ne knelt beside the halfling. Across from her, Rayne had already begun to heal the little mage. Reaching out, Sir�ne laid a hand atop the hand of the other priestess, lending her own power to the healing. Posted on 2013-08-31 at 16:33:33. Weaver stood crouched low; sword and dagger ready to strike. His eyes and ears on full alert almost to the point of pain, his body was in full reactive mode. His mind went back to the scare around his neck when the DeadWood tribe had him in the Dark Forest; they had tried to kill him. He spat on the ground, �Bastards! Children of a motherless goats!� His head tilted slightly to the left as he strained to hear. Seconds passed like hours. Weaver�s mind then drifted to moments by the fire with his Ulthok, Master of Shadows and friends, a tear slipped from the old elf�s eye and ran down his young face and then fell from his chin to a death upon the cold stone ground to mix with water and goblin gore. A low growl escaped his lips, it was in Maggot�s gruff voice he could be heard, �Brothers you have your head in the clouds and all is not what it seems. We have our feet on the ground and we do not sleep to dream. Gods do not take Master Ulthok, for we still have much hell to raise.� Weaver began to move from side to side as a cat ready to pounce. Weaver then called out, �Will he live?! Will Ulthok live?! Does my brother still live?� his voice tapered off. Posted on 2013-09-01 at 02:29:02.